The allure of big boys' toys appears likely to cost Japan's low-cost Skymark Airlines its reputation, a lot of money and most importantly management focus at the very time when Skymark needed to respond to a raft of new LCC competition in its domestic heartland. Skymark is putting a bold face on the planned delay – or even cancellation – of six A380s it has had on order since 2010, taking the position that the best defence is a strong offence. A statement talked of Airbus imposing "an exorbitant penalty that evades common sense" if the order is cancelled. It appears from the statement that Airbus has sought to find a way out for independent Skymark, "to enter under the umbrella of a major airline." Negotiations to delay delivery or cancel have, according to Skymark, been under way since Apr-2014. Skymark gives the reason for its move as a "business environment [that] has become severe due to increased competition and the depreciation of the yen in recent years". Its international route plans had shortcomings for Skymark's first international excursion. Airbus has already begun trial flights with the first new aircraft, complete with Skymark's logo and partial interior. Two A380s were due for delivery in 2014, with another two in each of 2015 and 2016. The order – valued at USD1.3 billion at rack rates – was always a strange one that few in the industry considered a safe one. There will be much to come out in the wash but Skymark can recover and emerge stronger. A cancellation of Skymark Airlines' six A380s would enable – and force – Skymark to hone the strengths it created in Japan's domestic market before it overly-ambitiously leaps from operating only domestically to long-haul all-premium A380 services. Following discussions with Skymark Airlines and in light of the airline’s expressed intentions in respect of the A380, Airbus has in accordance with its contractual rights, notified Skymark Airlines that the purchase order for the six A380s signed in 2011 has been terminated. Airbus is reserving all its rights and remedies. Skymark's 2010 announcement of its A380 order for six A380s had caused widespread surprise in the industry. The airline was a successful but still relatively small domestic LCC with a short-haul Boeing fleet. The popular concerns had also existed at Airbus. On 28-Jul-2014 French paper Les Echos cited unnamed sources saying Airbus had dropped the order. Bloomberg followed-up with a report that the order was cancelled but could alternatively be delayed. Skymark in Jun-2014 announced about a six month delay to its A380 due to interior fit-out delays. These are understood to be legitimate and are impacting other operators, notably Qatar Airways and its A380. Skymark on 29-Jul-2014 issued a statement (originally in Japanese) from CEO Shinichi Nishikubo that seeks to deflect attention away from its over-ambitious plans and onto Airbus. Since the statement, in which Skymark said it was reviewing options, Airbus has said the order has definitively been cancelled. Skymark's options were never extensive and there is little reason they should improve. Even if the aircraft could join Skymark's fleet, their performance is far from certain. Skymark had carved a successful niche in the domestic Japanese market – the world's third largest – and until its recent annual loss had been successful in it. Skymark is probably well advised to hone its strengths in its core market rather than undertake ambitious and risky long-haul growth. It would have been a high profile move, especially in face conscious Japan, to cancel the A380 order, but if there was potential for the order to be delayed, it is undoubtedly in Skymark's best interests that the order be cancelled – if only to ensure Skymark's future. This raises the question of where the aircraft will go, assuming a compromise is not achieved. Two of Skymark's six A380s are in production although it is unclear to what extent the interior has been outfitted. At the very least, core infrastructure to support the cabin would be in place even if seats, galleys and the like are not. Each airline's customised A380 cabin makes it difficult, but not impossible, to accept frames meant for another customer. Skymark eventually planned to outfit its A380 in a two-class all-premium configuration of 280 premium economy seats and 114 business class seats. This low-density configuration of 394 seats, favoured by some in the early days of A380 deliveries, potentially makes it hard to sell to another airline. Turkish Airlines for example has expressed interest in acquiring A380s in the short term, but its 777-300ERs already seat 337, meaning there is a large cost to bear to gain only 57 seats (and potentially less cargo room). Nearly every aspect of Skymark's proposed long-haul A380 flights raised questions. The project's origin, for example, is unclear, but likely not grounded in firm research. Some have seen the project since day one as rash. Even Airbus was surprised at Skymark's interest in the A380. For its international operations Skymark would operate initially to New York JFK, later adding London, and likely Paris and Los Angeles. However in all of these markets Skymark would compete against joint ventures: in the trans-Pacific, ANA with United as well as JAL with American, and to Europe ANA against the Lufthansa Group and JAL with British Airways and Finnair. Skymark would not even have partners to provide feed at the North American or European points. Adding partners would not have been simple as Skymark's basic IT precluded even interlines. Skymark planned to operate from Tokyo Narita Airport, where its domestic network is small and decreasing. Domestic Japanese connections would require transferring between Haneda and Narita airports at a time ANA and JAL are building long-haul Haneda flights and also have domestic connections at Narita. Although Skymark is a known entity in Japan, it is less known (if at all) outside. Distribution could have been challenging as its core premium economy cabin might not have been visible to passengers or agents looking for economy fares, or if listed as economy would under-sell the product. Large Japanese travel agency H.I.S. owns part of Skymark, although it seems H.I.S. did not have the appetite to support Skymark's A380 flights at any cost. Even if the seats could be sold, such a low-density configuration on the A380 would have been challenging. Further, Skymark's A380 would have been the first time Skymark had entered scheduled international operations. The market outside Japan is uniquely different from the extremely nuanced Japanese market, representing a huge leap in internationalisation Skymark may not have been prepared for. Using a smaller widebody in a more standard configuration would reduce some risks for A380 destinations but many elements would remain. There is potential for Skymark to fly internationally and even long-haul with its A330s currently used in the domestic market but that would be on less competitive and more leisure-oriented routes, such as to Hawaii. Destinations like New York and London may have prestige but are accompanied by serious competition from all the major global airlines. Jumping in at the deep end could never be a sound strategy. The financial implications of this spat and its potentially difficult outcome will give a substantial jolt to Skymark's operations. Its profile faces a more limited impact, at least domestically where it counts; those in Japan saw this order as an aberration. They are not surprised to see it cancelled. It was those outside Japan that knew Skymark only for wanting to fly A380s, ignoring or not knowing what Skymark has done domestically. Establishing partnerships could be a new avenue for Skymark's domestic network, although given the situation Skymark faces this is not an immediate priority. Any thought or discussions Skymark had about partnerships could be funnelled into its domestic market, giving at least one (although small) silver lining to the emerging A380 debacle. Skymark's partnerships are limited to an extremely simple and one-way arrangement with Delta Air Lines whereby Delta frequent flyer members in Japan can redeem miles for Skymark tickets. Skymark could potentially receive domestic feed from international carriers, building a small but nice business. Bangkok Airways, JetBlue and to a lesser extent Virgin Australia are alliance-neutral partners in their respective domestic markets. International traffic at Haneda, Skymark's largest base, is increasing. International carriers can work with ANA or JAL, but independent and SkyTeam carriers are left without a clear-cut partner. There are exceptions. SkyTeam's Air France for example has a close relationship with oneworld's JAL for historical reasons (KLM does not, however). Even Star and oneworld carriers might like another alternative in the Japanese market as Skymark covers Japan's core destinations with good frequency at a fraction of the cost of ANA and JAL, whose interlines and regular short-haul fares can be expensive. 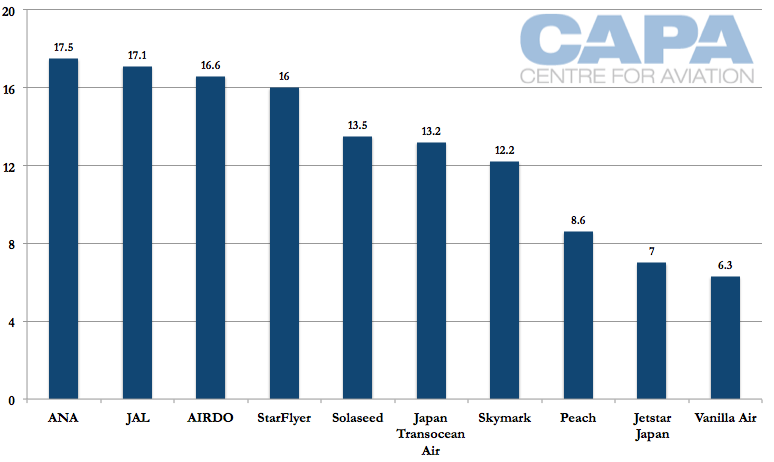 With load factors around 70%, Skymark has room to take additional passengers. A frequent flyer programme, currently lacking at Skymark, could create further stickiness. The loyalty programmes of ANA and JAL have been critical to them maintaining market share. A loyalty programme gives Skymark opportunity – and is potentially now holding the carrier back. Skymark is understood to have been working on a loyalty programme but postponed it as it dealt with the A380 and A330. Skymark's key advantage is its portfolio of slots at prized and constrained Tokyo Haneda Airport. Skymark is deploying A330s to grow in absence of additional slots. Skymark has received two A330s with a further five on direct order with a further three to come from lessors, giving Skymark a total planned A330 fleet of 10. Firm orders include those placed directly by the operator and by lessors assigned to the operator, from 28-Jul-2014 onwards. The A330s allow Skymark to grow and are outfitted in an all-premium-economy "green seat" configuration that is being well received by the domestic market. Skymark has yet to state financial indicators (there are large start-up costs from introducing the A330s), but the rationale for the project is that Skymark can grow capacity and offer a better product than ANA or JAL at comparable prices. Skymark in Jun-2014 carried 93,005 passengers on the Tokyo Haneda-Fukuoka route, which saw A330 introduction in Jun-2014. 737s continue to operate some frequencies, with an all-A330 service planned for Sep-2014. Skymark's loading was a 0.4% decline from Jun-2013, but this was on the back of a 9% reduction in frequency, allowing Skymark to use those slots for other services. 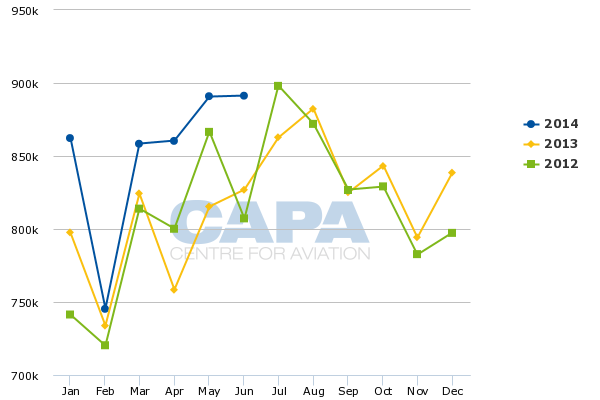 Wider and consistent A330 deployment has the potential to increase passenger figures. Tokyo Haneda-Fukuoka is Skymark's sole A330 service, with Tokyo Haneda-Sapporo A330 service due to commence in Aug-2014 with one daily service on the sector until 30-Sep-2014 with plans to increase A330 frequency from Oct-2014 following delivery of its fourth A330. 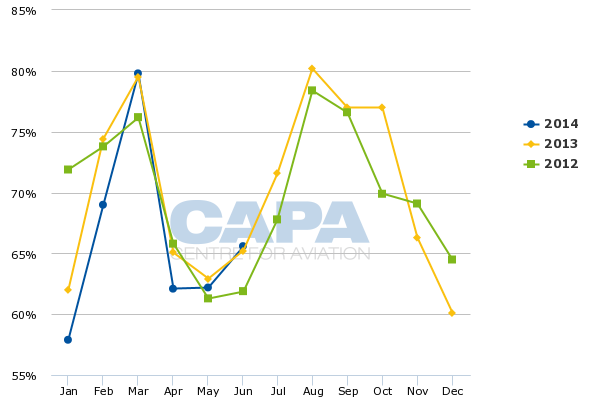 In 1QFY2014 (Apr-2014 through Jun-2014), Skymark reported consistent traffic growth above 2013 and 2012 levels, an encouraging sign. After a number of difficult years of declining traffic, the domestic Japanese market is now growing. Japan’s airlines carried approximately 90 million passengers in FY2013, up 7.8% from FY2012’s 83 million passengers. Domestic passengers in 2012 were at levels comparable to 1997. But continued growth should in short order see Japan break records, finally giving it the growth the rest of Asia has experienced. This translates to opportunities for Skymark, and arguably opportunities it needs to seize. Skymark was absent from FY2013's traffic growth, actually carrying fewer passengers than in FY2012 as it made adjustments and fell behind on performance. ANA made the largest contribution to passenger growth while Jetstar Japan and Peach collectively had a similar contribution to ANA. 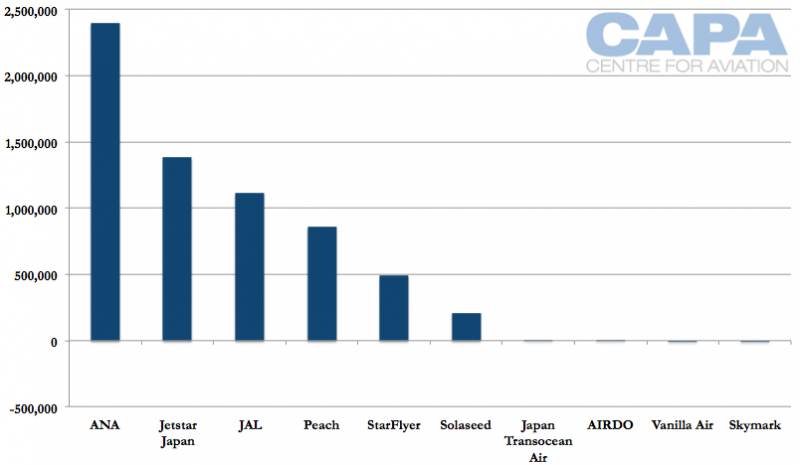 So Skymark, as a hybrid carrier, has been unable to achieve the growth the full-service and low-cost carriers can. With its restructure behind it and use of large-capacity A330s, Skymark should be in a position to make a meaningful growth contribution in FY2014. 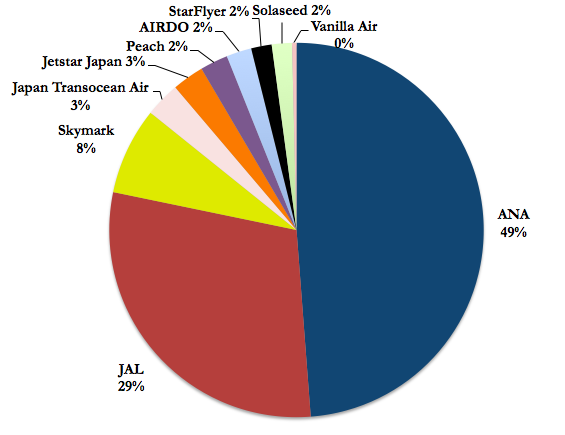 Although Skymark is Japan's third-largest domestic carrier, this is with an 8% share, much smaller than ANA's 49% or JAL's 29%. Skymark's theoretical opportunity is a cost base about half that of ANA or JAL but yields only a fraction lower, allowing a healthy margin. 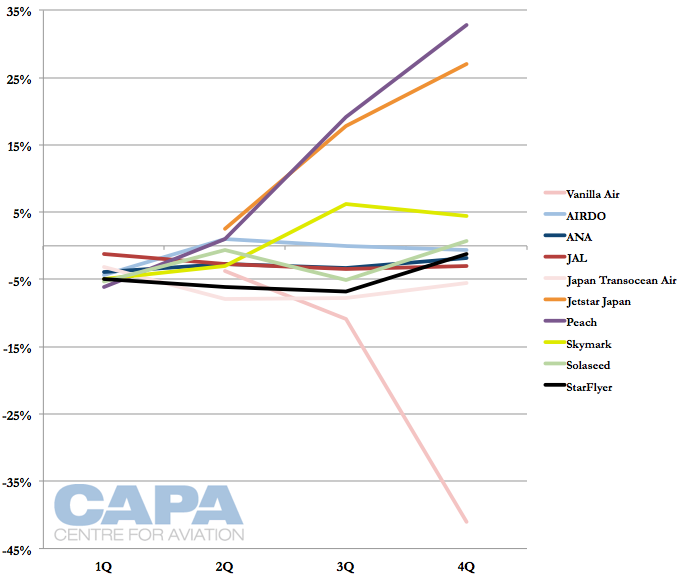 Encouragingly, in FY2013 Skymark saw yield growth, unlike ANA or JAL. Skymark portrays itself as the challenger and non-conformist in Japan. This has largely, but not always, brought it success. Tokyo Haneda slots and a lower cost base than the relatively bloated ANA or JAL are critical advantages. But long-haul international is a very different environment, especially for a company entering international operations for the first time. A partnership of any sort should not have been optional; it was essential if the A380 project of a little known Japanese LCC/hybrid with limited IT connectivity was to have a chance of survival. And even then there would have been extreme risks, so it was logical for Airbus to push for a sounder, partnership-driven strategy however unattractive. Skymark may value its independence, but having friends can be a good thing. And at the end of the day it must pay its bills. It will take time for Skymark to put this affair behind it. Airbus will be anxious to avoid ugly public confrontation, but there are big dollars involved here. Even if Airbus is able to find another buyer/lessor – and despite the widespread scepticism, there will be buyers – the transaction will be well below rack rates and Skymark is unlikely to escape some of the resulting fallout. Mr Nishikubo is a hands-on CEO and he has brought success to Skymark, his baby. But the A380 diverted far too much management time and resources. The proposed loyalty programme, for example, fell victim to the excessive number of projects at Skymark. All signs point to Skymark's A330 strategy being worthwhile, and the reduction of Narita services logical as they were unsuccessfully competing there with LCCs. If Skymark's attention can quickly return to domestic operations, this cloud could have a silver lining as Skymark redefines its prospects in a growing and changing Japanese market. Skymark has the right fundamentals, and with some work and development can grow to become better than it has ever been. The A380 saga is a dampener to an otherwise positive airline history that has seen little international recognition. There may not be fame in discarding these big boys' toys, but being a quiet achiever should not be all bad.